The view west from the car park, one of the few oaks on the edge of the holly trees framing a perfectly clear sky (apart from the odd contrail). After a short walk along the ridge, the three ponds come into view. The largest is often used by the Solent Radio Controlled Model Boat Club. In fact last time we were here we met one of their members and his beautiful handmade craft. 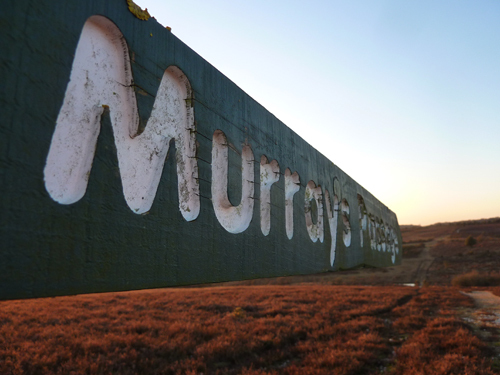 I turn left and head down across Murrays Passage. 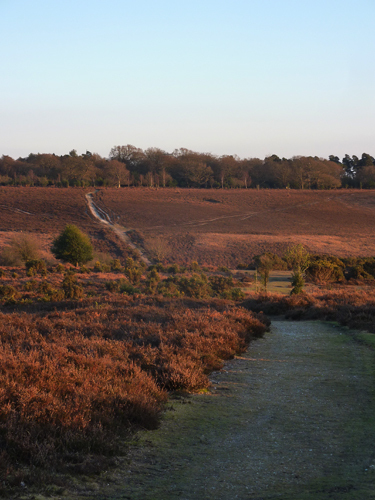 In the New Forest, a passage is a safe route across a boggy valley or ‘Bottom’. Murray’s Passage crosses Withybed Bottom and is named for one Admiral Murray who was killed whilst out hunting in 1901. The passage was constructed using money donated to his memory. Withybed Bottom looking soft in the evening sun. To my left the rising ground and the sky create a palette of browns and blues. 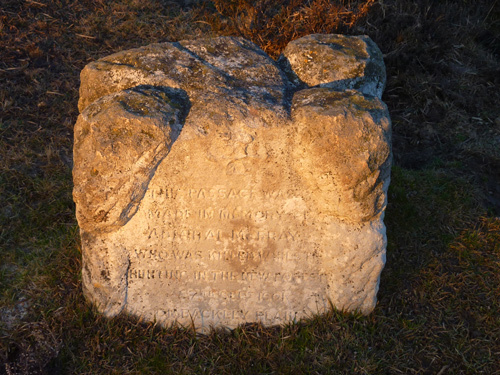 The Murrays Passage Stone telling the story of Admiral Murrays demise. At the top of the rise on the other side by Stonard Wood, the sign denoting its name. 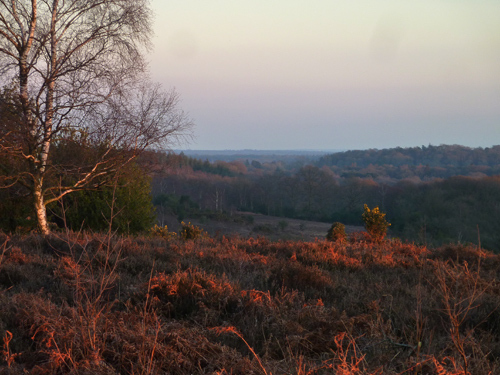 I make a detour through the edge of Stonard Wood to take in the view over Ringwood Ford Bottom. 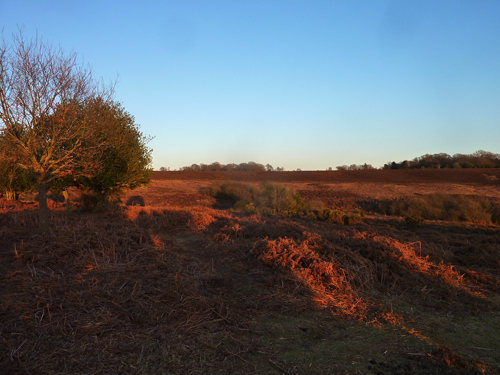 Golden light touching the old heather almost giving it back its autumn purple hue. 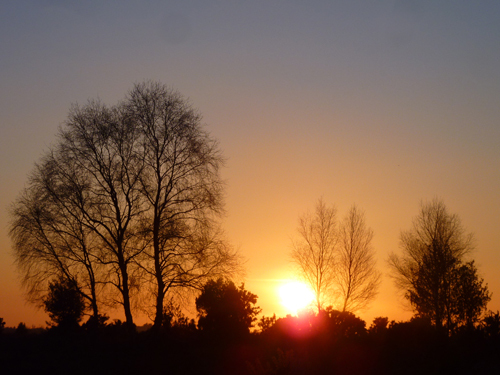 Turning back to my path, the trees on the ridge are silhouetted by the lowering sun. 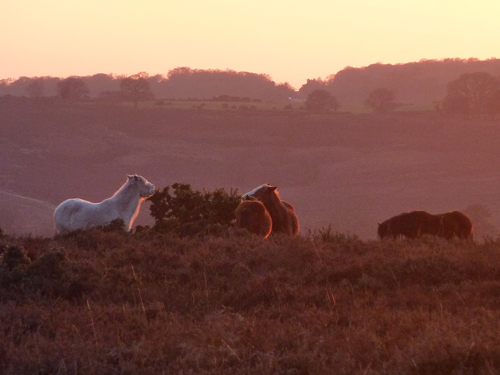 Back on my path towards Fox Hill, ponies eating gorse out in the heather. 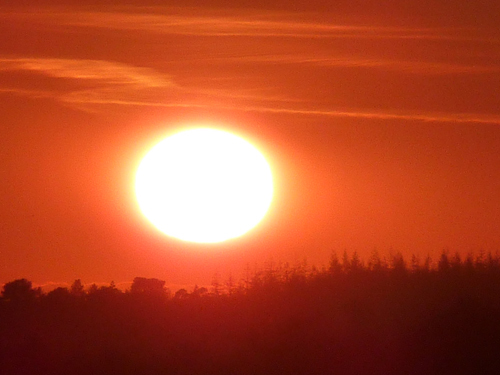 The evening haze has turned the sun huge above the horizon. 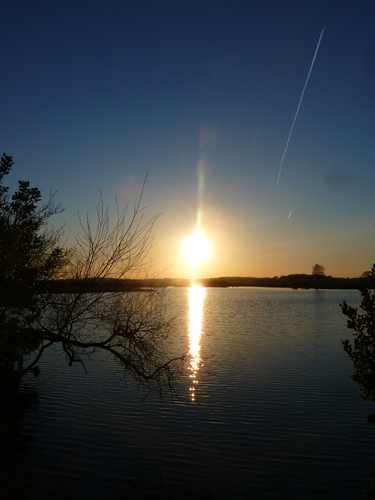 I bypass the car park and go back to the ponds to watch the sun go down over the water. Gentle ripples come from someone’s dog playing at the far edge of the pond. 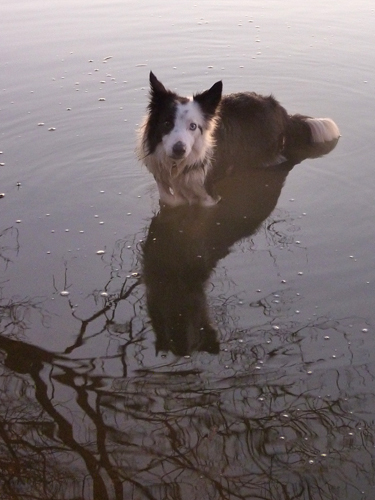 Harry decides to have a paddle too. The sun has gone leaving a deeply orange sky. 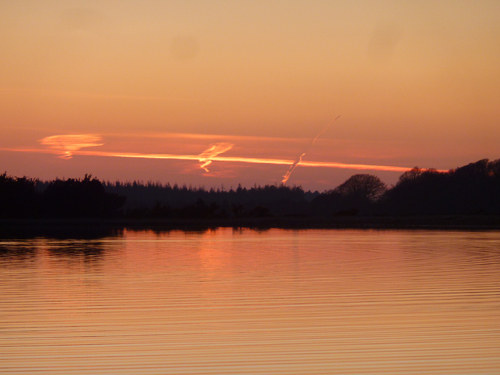 Strange scribbles of cloud and a contrail are lit up. 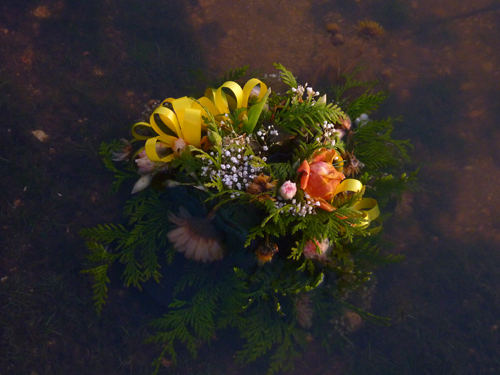 As I turn to leave, I spot this bouquet in the water. I wonder what the story is there? I came across your website from a link on David Hall’s Lake District site. I was intigued as I live in Southampton and walk miles in the Forest every week with my wife and our 7yr old Beagle ‘Yogi’. Andrews Mare is a particularly favourite area for us and when I recently took a group from St.James church in Shirley for a 10 mile round trip from there via the Reptilliary and Forest Inn at Emery Down they said it was the best trip we’ve done so far. Personally I love the area around Burley, so many different routes to walk and interesting folk to talk to. 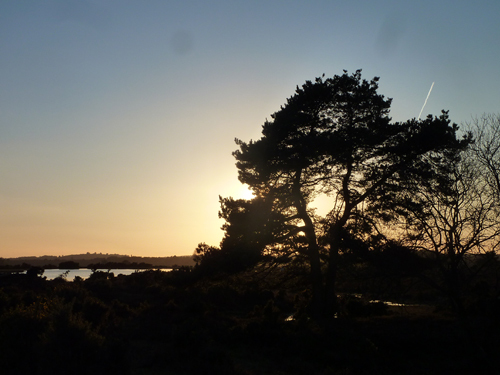 Without a doubt the New forest is the gem in Southern England and I am proud to be a Hampshireman. Thanks for a wonderful site with superb pictures, Lee Barfoot. Thank you so much for your kind comment. It is indeed a wonderful area of the Forest and we are so lucky to live in such a beautiful area of the country. 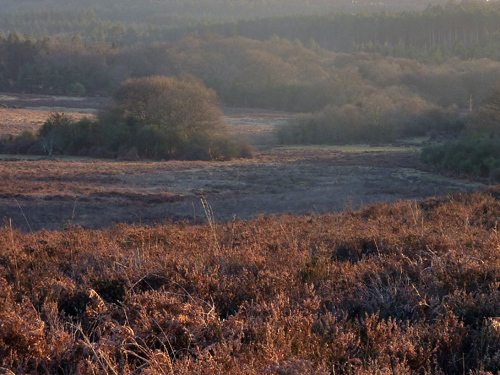 Your 10 mile round walk sounds marvellous – do you lead groups around the Forest regularly? 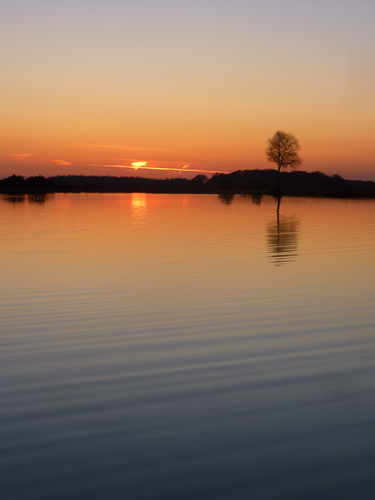 David’s site is a wonderful resource for those of us that love the Lakes isn’t it? Do you go to the Lakes too?